Everybody loves collecting seashells on the beach and I’ve collected a few myself. Sandy beaches are great for finding beautiful shells because scouring sands keep them clean and round off jagged edges. Currents transport shells long distances from their home waters, so you never know what you’re going to find. 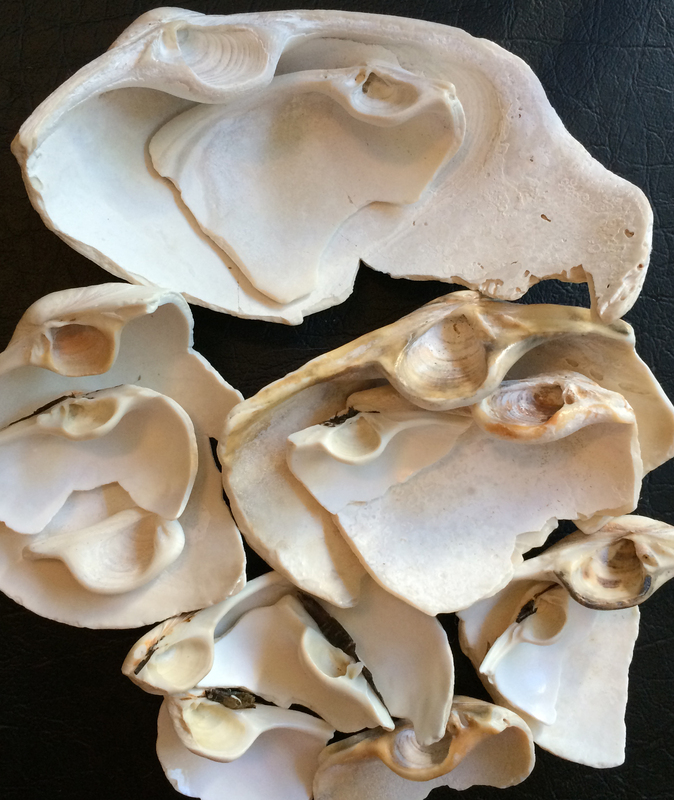 I wrote about this in Answering the Clam Challenge: Which Shells for Which Beaches? If I’m walking along the beach, I’m thinking about the tides, watching the surf and keeping an eye out for interesting items in the driftline. The sweep of the surf reveals lots of shells, often only fragments; and learning to identify them has become a rewarding pastime. Lots of shells end up on the beaches and with a little practice, most are easy to identify. Here are a few I’ve found. You can easily a distinguish a gaper shell, even a fragment, from other shells on the beach by the the distinctive spoon-shaped chondrophore on the hinge. It’s the toughest part of the shell and the last to disintegrate under constant sand scouring; in gaper country chondrophores get abundant. I happen to have 23 chondrophores. I collected them haphazardly over the past few years and haven’t looked at them much, but I examined each one while writing this post. Turns out I collected 12 left valve and 11 right valve chondrophores. No valve bias here. Allowing that there may have been a bit of erosion along the ventral margin, looks like I was right – fat gapers. I look forward to finding the shell of the Pacific gaper; I’ll keep my eye on the driftline. Harbo, R. M. 2011. Whelks to Whales: Coastal Marine Life of the Pacific Northwest. 2nd ed. Harbour Publishing Co.
Kozloff, E. N. 1993. Seashore Life of the Northern Pacific Coast. 3rd ed. University of Washington Press. Lamb, A. and B. P. Hanby. 2005. Marine Life of the Pacific Northwest. Harbour Publishing. Ricketts, E. W. and J. Calvin. 1968. Between Pacific Tides. 4th ed., revised by J. W. Hedgpeth. Stanford University Press. Sept. J. D. 2009. The Beachcomber’s Guide to Seashore Life in the Pacific Northwest. Revised ed. Harbour Publishing. My thoughts and experiences on the exposed outer coast. Lots of photos and a few words about intertidal nature. I’m always thinking about sandy beach connections to its sister ecosystems, the rocky intertidal, estuaries, and coastal forests. You can see photos of things I’ve found washed ashore on my Wrack Line pages. If you are looking for new takes on common intertidal algae, plants, and animals, I’m always updating my Variety of Life pages. I love the full-page layout on all theoutershores’ pages.